EXTENSION ARM: Reliable Heavy-duty 100% Solid Brass Construction Height and Angle Adjustable 2-foot Vertical Movement Range 180-degree Adjustable Solid Brass Ball Joints Reliable, Easy-to-Tighten Solid Brass Wing Nuts. 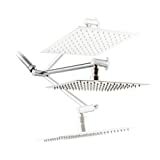 RAIN SHOWER HEAD: 10" Stainless Steel Square Rainfall Shower Head Heavy-duty 304 Stainless Steel Construction 100 nozzles for superior water flow coverage Easy to Clean Rub-Clean Jets Slimline Square Design Solid Brass Ball Joint Nut Angle-adjustable. 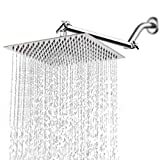 FEATURES: Stainless steel construction Ultra Thin profile 10 inch by 10 inch Square Showerhead Face Easy to clean Precision-Flow Rub-clean jets High-polish Chrome Plated Finish Angle-adjustable. INSTALLATION: Tools-free Installation. Connects in minutes to any standard overhead shower arm, no tools required. WARRANTY: Limited Lifetime Warranty - Once you purchase any of our products, you will enjoy Gold-Standard Customer Service with Instant Hassle-free Return or Exchange Policy if not 100% satisfied. POP 10-Inch Adjustable Square Rainfall Shower Head with Solid Brass Adjustable Extension Arm (180 degrees Adjustable) features: 10" Stainless Steel Square Rainfall Shower Head: Premium Quality Rainfall Showerhead found in Top-rated Hotels and Spas Heavy-duty 304 Stainless Steel Construction Giant 10" face with 100 nozzles for superior water flow coverage Easy to Clean Rub-Clean Jets Fashionable Slimline Square Design Solid Brass Ball Joint Nut for reliable connection High-polish Chrome Plated Finish Angle-adjustable 11 inch Height/Angle adjustable Solid Brass Extension Arm: Reliable Heavy-duty 100% Solid Brass Construction Height and Angle Adjustable 2-foot Vertical Movement Range 180-degree Adjustable Solid Brass Ball Joints Reliable, Easy-to-Tighten Solid Brass Wing Nuts Designed to hold extra-heavy showerheads at any angle with advanced Anti-Sag Position Lock design High-polish Chrome Plated Finish Both Shower Head and Extention arm connect in minutes without tools or plumbing to any standard overhead shower arm. 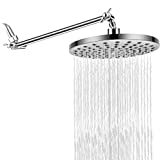 Shower Head Rainfall High Pressure 9.5” With Adjustable Extension Arm 109 "
Locking Gears Hold Shower Head In Place. Includes Teflon Tape/No Tools Required. With our long adjustable shower head extension arm, you're in charge of your shower experience! With 11-inch,13-inch or 15-inch arm length options you don't have to worry about not having enough room in your shower ever again. 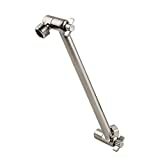 Our shower extender arm is built with the highest-quality brass and finished in chrome to add a sleek and modern look to any shower. Locking gear technology enables you to make any adjustment to the shower extension arm without it slipping, no matter how small or large the adjustment! You'll never be frustrated with adjustable shower arms that don't keep the adjustments you make again! Our extension arm fits with any shower head. It allows for high water flow so you won't have to sacrifice water pressure while using it. The inside hinge makes this shower extender arm the best you've ever owned! Make your showering experience easy and enjoyable! At Genesis Bathroom Creations, our values of quality work and extraordinary design inspire all our creations. We guarantee that all our products are made with the highest quality parts, built with care, extraordinarily designed, and easy to install. At Genesis Bathroom Creations, we don't just make the best quality bathroom accessories, we custom-build items of beauty and durability that you can enjoy for years to come! We prize both functionality and style and we work hard to ensure each item we make is built with both qualities in mind. RAINFALL SHOWER HEAD - Designed to give the experience of showering in the rain. Exceptional performance at low and high water pressure. Integrated quality solid brass ball joint that lasts a lifetime. Universal shower head with more coverage in your shower..
REMOVABLE WATER RESTRICTOR - Save money on water and energy bills. Quality designed to reduce water flow in the shower head to 2.5 gpm. If you live in an area with low water pressure, removing the water restrictor will return your showerhead pressure to normal..
TRANQUILITY & RELAXATION- Enjoy a gentle, soothing, relaxing shower. Ultra realistic feel to the water spray. Shower in luxury and comfort, your very own raincloud each morning at the temperature you desire.. COMPLETE SHOWER HEAD KIT - Your shower head kit includes a 13.5 inches Premium adjustable shower head arm for maximum height and distance adjustment, rainfall shower head, teflon tape, 1 mesh filter, 2 gaskets. User manual with easy-to-install instructions with pictures..
WARRANTY - Includes a No Hassle money back or replacement guarantee!. USA Quality Standard Exceptional low and high water pressure performance, water saving shower head that deliver a gentle, soothing, relaxing shower. Turn your average shower into a great shower. Why you'll love the RongMax Shower Head Modern Design Great style and flair 13.5 inch extension arm has a further distance from wall than 10-11 inch Your bathroom and shower will look like a million dollars. Your bathroom and shower will have a 5-star hotel room finish. More coverage in your shower. With a large and even rain shower head you'll always be covered and have a great shower every time. With a sparse and uneven shower head, you'll always have an average shower, not a great one. Excellent build quality and ultra-realistic feel to the water spray. Carefully constructed of high-quality, rust-free material so you can enjoy it for many years. Likely to encourage you to have a longer shower because it is so enjoyable to be under. Easy to install, hand tighten or use a wrench to tighten it easily. What's Included Universal shower head with 112 self-cleaning nozzles that delivers excellent water flow 13.5" premium shower head arm for maximum and distance adjustment Pre-installed water flow restrictor that limits the shower head to 2.5 gallons of water per minute 1 mesh filter 2x O-ring gaskets Teflon tape Step by Step Installation Manual REMARK: the spare units of gaskets, teflon tape are gathered in a small bag and put into the box of extension arm. ENJOY A POWERFUL RAINSHOWER: Laser welded seams ensure our shower head always stay water-tight and produce the best pressure possible even if your home has low water pressure. This shower head can save more water resources when it keep on working in one hour compare to other shower head..
RUST RESISTANT FEATURES & SELF-CLEANING: The shower heads are manufactured from solid stainless steel for the highest rust resistance and longevity.The interface of the shower head is made of soild brass, which is corrosion-resistant and can reduce bacterial growth.The premium quality soft and self-cleaning silicon nozzles eliminates leaking and prevent calcium build-up (no more annoying leaking and blockages)..
EXTRA-LARGE RAIN SHOWER HEAD: Extra-large (12 Inch) face and 360 degree free rotation shower head with 144 high pressure silicon nozzles is ideally suited for your lover to experience the ultimate intimate bathing experience. The shoulder-to-shoulder water flow coverage and mirror-like chrome of the shower head will make you fall in love with the exotic shower experience..
ADJUSTABLE EXTENTION ARM: 11'' Shower Head Arm. Made from solid and durable brass. Not worry about breaking or leaking. Allows you to adjust the showerhead for best angle and height. 2 YEAR WARRANTY AND QUICK INSTALLATION: HarJue manufacture premium rain shower heads at affordable prices. We are totally confident of our quality control. It is for this reason that we are not only offering a satisfaction guarantee but also a 2year warranty. No need any tools. Simply screw on and turn on your new waterfall shower. For added convenience, we still provide a dedicated tool. Let the entire installation process take only 5 minutes. 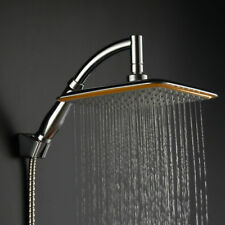 Description:Our shower head is made of high-quality stainless steel material, very sturdy and durable to use. And the water nozzles are adopting environmental-friendly rubber material, safe and healthy, and they could ensure a stable and smooth water flow. It is simple to install and easy to clean. Modern style, high grade large square and thin design, best choice for your home life. Just enjoy a wonderful and relax bath with our shower head. Worthy to buy.Features:Top quality: SUS304 stainless steel % solid brass with chrome finish for the highest rust resistance and longevity.The spray nozzle is made of soft rubber, durable and hard to cause blocking, offer you best shower experience ever.Very smooth, highly polished, mirror-like chrome finish making it a beautiful addition to any home decor style.Easy to install, comes with the shower arm and shower hose with standard G1/2 inch thread to optimize the installation process.Perfect festive decorations in your bathroom, transform your bathroom into a joyful space, making a pleasure in your shower.Specification:Condition: 100% Brand NewShower Head Material: SUS304 Stainless SteelShower Arm Material: BrassHose Material: Stainless SteelThread: G 1/2"Shower Arm Length: approx. 425mm / 16.73inchHose Length: approx. 1.5m / 4.92ftShower Head Size: approx. 20 x 20cm / 7.87 x 7.87inchPackage Weight: approx. 1.3kgPackage Included:1 x Shower Head1 x Shower Arm1 x HoseNote:1. Please allow 1-2 cm error due to manual measurement and make sure you do not mind before ordering.2. Please understand that colors may exist chromatic aberration as the different placement of pictures.